● Scissors: Children need age-appropriate scissors so they can start to be more independent. From the age of three they can start using safety scissors under supervision so buy a set that come with good safety credentials and let them begin by cutting pictures out of magazines to make collages. Older children can draw their own pictures or make paper dolls and cut them out. 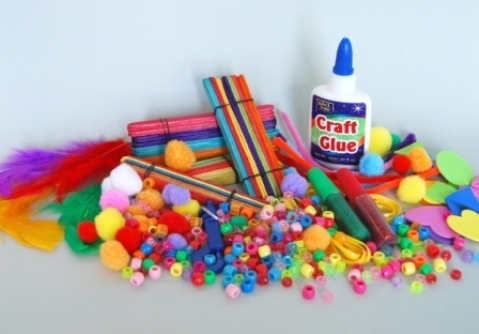 ● Glue and Adhesives: No craft box is complete without some proper adhesives so children can stick the component parts of their models together. Glue sticks tend to be better (and less messy) than tubes of liquid glue as they are easier to control with accuracy. Glittered glues are also very popular (although, as these do tend to come in tubes, you’ll have to prepare yourself for a bit of mess). A kids’ sellotape dispenser is also very useful for those items that can’t easily be glued. ● Paper: You can do so much with a good range of coloured and patterned papers so make sure you guy a good variety when you’re getting your supplies. The above-mentioned handyhippo.co.uk has a great selection of papers and cards from corrugated in several colours to glittery paper, zebra print, tissue paper and much more besides. ● Foam: Coloured foams are great for adding texture for artwork and they’re also more durable than paper so they’re better if your child wants to make something that will last a little longer. They are also cheaper than a lot of fabrics and can either be bought in pre-cut shapes of in squares for your children to cut into whatever shapes they want. ● Crayon, Markers and Paints: Crayons are very cheap to buy but if you’re looking for something a little brighter then there are plenty of washable markers available today. You can even get markers that can be used on windows. If you’re feeling a little braver you can also get the paints out but this will of course involve a lot more mess so make sure you put down plenty of newspaper and put your children in old clothes or aprons. Don’t forget you will need plenty of paint brushes too, especially if you have a lot of children to entertain as you don’t want any squabbles. ● Yarn: You can do all sorts with this, from making pom poms to soft monsters, bugs and animals. It also comes in any kind of colour imaginable. You can also wrap it around straws or lolly sticks to make picture frames or for use in models. ● Decorative Items: Kids love to decorate their creations, so make sure you get a good variety of things in to choose from. Sequins are always popular and they come in a huge range of shapes and colours and the same applies to plastic gemstones. You should also invest in a lot of beads, buttons and glitters, but if you don’t have the money to buy all these extra items you could simply go for things like shells and coloured pasta. ● Household Items: Alongside all of the above things which can be purchased from craft shops, you should also be looking to recycle things from around the house. Keep hold of any toilet roll holders, empty margarine tubs, lolly sticks, yoghurt pots and so on as they will always come in handy when it comes to making models.